Expand “Month settings” block. This view setting can be applied for the Month view. Select the day from which calendar week will start (Monday or Sunday). 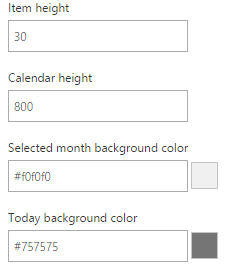 Then enter the item height (30 pxls recommended), calendar height and select month and today background colors.